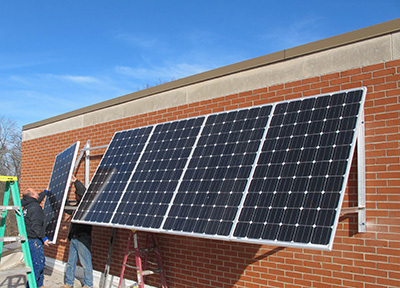 Worthington, Ohio has two new solar schools! The first was installed on Colonial Hills Elementary School just east of High Street and just south of State Route 161, in the area known as Colonial Hills. The second was installed on Linworth Alternative High School which sits on SR 161, just West of SR 315. The pix below show that both solar school installations are awning mounted. Tim Gehring, with the Worthington School District, is the primary contact for both schools and has helped guide solar projects on several of the Worthington Schools. Both projects were done by Solar Cascade with founder Thomas Van Cleef as the primary contact at Solar Cascade. Funding for these two projects came from a variety of donors. 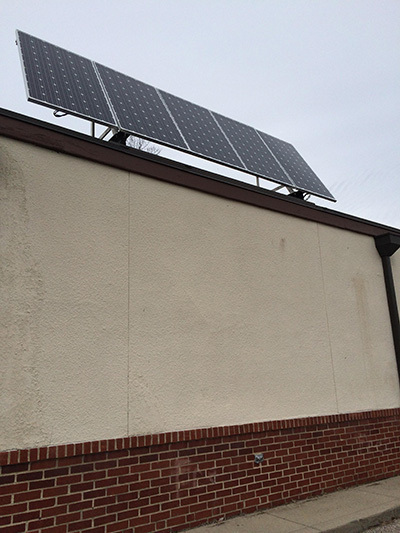 Canadian Solar donated the photovoltaic (PV) panels for both schools. Enphase donated the microinverters for Linworth Alternative High School. Tilton Automotive, Mary Ellen’s Starr’s family, The Columbus Jewish Foundation donated funding to the projects. Solar Cascade also donated time and materials and some funding and the Foundation for Environmental Education also donated some funding. And the Brian David Robertson Memorial Solar Schools Fund (BDR Fund) arranged for the donated equipment for both projects. This entry was posted on Saturday, March 28th, 2015 at 12:14 am and is filed under District of Columbia . You can follow any responses to this entry through the RSS 2.0 feed. You can leave a response, or trackback from your own site.